Control is the name of the game in this sneaky tough SpeedSculpt led by Trainer Rebecca. High reps with controlled combo moves leave the body feeling extra lean. It is full body, but the abs, shoulders and buns get a higher dose of love here, so think about spending 25 minutes here right before date night and you’ll feel smokin’ hot! Loved this blast from the past. Solid workout! MM2019 Tough core – tough sculpt. Love it. Added this on to Rebecca’s new rock ride! Awesome class – my arms feel done-in! Done. It’s been a long time since doing this one. So fun. Thank you Rebecca! Drive to 25: all I have to say is…omg!! Loved it! Drive to 25…9/25..great sculpting class. I forgot how brutal this one is! Thank you! Great SpeedSculpt! 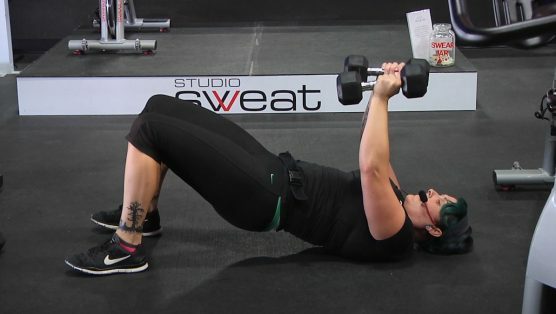 Compound moves are one of my favorites – so efficient! I loved all the core work, and I really pushed myself during Word Up! Thanks, Rebecca! Wow my arms are jello. Awesome!! Only 25 minutes?! My heart is pumping!!!! No excuses! Ha. It’s amazing what you can do in 25 min right! I love this sculpt. It is very effective! This is a quick functional workout hitting every muscle group in your body only using dumbbells. You’ll need a couple sizes (heavy set and medium set) to really get the most out of this hard hitting and fun workout. Get ready to sweat and build some strong lean muscles! One on one with Iron Woman Rebecca. Let’s do this! You won’t need much space to get your burn on for this hour! Grab a medium and light set of dumbbells, and don’t forget the mat if you have it, and water of course. Kickoff with a no nonsense warm-up, then quickly get the upper and lower body burning. Your muscles will be absolutely exhausted but feeling good after this session! Show Rebecca what you got! Don’t have a kettlebell? No problem, just grab a set of light dumbbells and a single heavy dumbbell to play the part, and get ready to HIIT it hard! Luana structured this circuit-styled awesome Kettlebell class with 2 strength exercises, followed by a Higher Intensity cardio move. If you are a hard charger and the recovery breaks given are longer than you need we strongly encourage you to do jumping jacks to keep your heart rate increased. Just make sure your tank is full for the next set because the idea of a HIIT class is to push hard, recover long enough to re-gain full strength, then hit it with all you have again! Expect 4 circuits, each with 3 exercises, all done for 3 rounds… then you get to finish it off with a killer Ab Circuit! Expect a little bit of burn and a lot of SWEAT. Nice! Looking for a workout where the idea is to tighten and tone your total body? Sweet, then this is the one for you. We hit all major muscle groups… and a few times. When you begin to feel the burn as the lactic acid builds up in those muscles, just remember, that is when you KNOW changes are happening! So, get your weights and get ready to push through this challenging power workout!